Sidney Fletcher died in 1898. In his will he left his farm, Tusculum, to his cousin, John Jay Williams. Mr. Williams and his family lived in Chatham, New York. Before Sidney died, John Jay Williams wrote from Chatham to ask Sidney if he needed help. 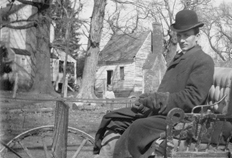 Sidney wrote back that he and Indiana needed help and John Jay and his wife came down to Virginia soon thereafter, around 1897. They first went to live at the Silk Farm (one of Sidney's properties). Six or seven months later Sidney died and left them Tusculum in his will. One of their sons was born the November after Sidney died and was named after his deceased uncle, Sidney Fletcher Williams. Mr. Williams and his wife raised five boys before divorcing in 1935. John Jay Williams was a descendent of Lucy Fletcher (Elijah's sister). With thanks to Jackie Williams Beidler for providing some of the information in the above narrative and family tree. 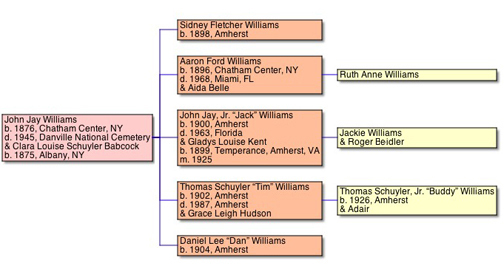 John Jay Williams is related to Elijah's sister, Lucy, who married Dr. Richard P. Williams. He is not related to James Henry James (Indiana's husband). John Jay Williams, circa 1905, in front of Tusculum.